The Marabou stork (Leptoptilos crumenifer Lesson, 1831) belongs to the order of the Ciconiiformes and to the family of the Ciconiidae. It is the biggest member of its family and in the winged world, one of the biggest flying birds. There is no village in Africa, in particular along rivers or water streams but also in the cities and small gatherings of huts, where this bird is not present and where it contributes to a fairly essential activity for the human community: the cleanliness. 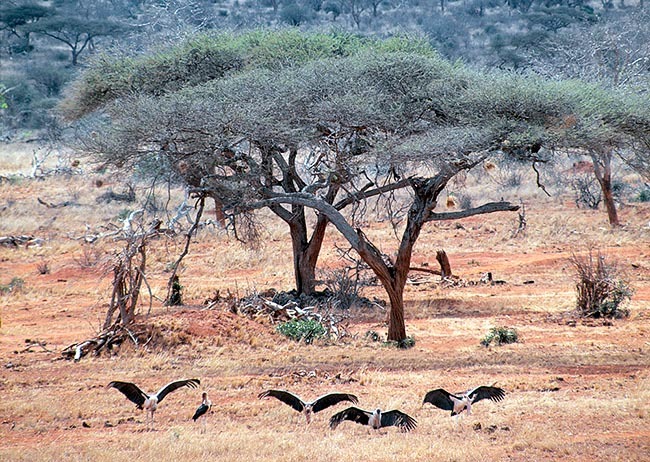 The marabou stork is the typical scavenger. It goes wandering between the houses or it stands on top of the huts waiting for somebody to throw something on the road, surrounding impatient the fishermen boats when they get back from fishing or rummages in the garbage together with dogs and vultures. It is a giant bird, as tall as an adult boy, with stocky body and supported by two long and strong legs. Perched on a hut makes it seem tiny and at times unable to support the huge weight of this bird. When we talk about the beauty of a bird, of its gait, of its elegance, well, this is not really the case of the marabou. It stands among the ugliest birds extant on the planet and in a contest with few others belonging to its kingdom, it should be the winner. It has a look considerably clumsy and dirty, worsened by the bare skin covering the neck and the head, covered by greyish and hardened with dirt scales that cover almost totally the beak going up to the front. Then, that decomposed and sparse down covering the head that it gives even more the appearance of disorder which is the peculiar characteristic of this bird. Finally, the immense goit, long, ungainly and mushy that moves waving contrariwise to its gait and that seems to be an ill grown and unwanted excrescence, also covered by sparse, uncombed, misplaced down. Perhaps this ugliness has led the human being with whom it coexists peacefully since always, to the conclusion to leave it alone not knowing what to do with such an eyesore. But the marabou has hidden virtues it does not exhibit when down-to-earth, at the same level as those human beings who judge it after their own standards, so viciously. When flying, it’s a majestic bird, incredibly light, master of the air perhaps more than the vultures, capable to keep stuck to the sky like a kite, motionless and gliding for hours as if staying up there might be the only way for forgetting how it is poorly considered down there, hundreds of metres below. Perhaps we shall never know, but from up there it takes its revenge on us and on our bad considerations. Il The term marabou has been taken from the French “marabout”, in turn coming from the Arabic “murābit” = sentry, rightly for its usual posture when on the ground, erect and motionless like a sentinel. It is fairly probable that by analogy with the term murābit it is meant also the Marabout, the typical African Islamic ascetic, important character in the country villages, also described as a person with important and superior posture. A small anecdote, the family name Morabito, quite typical of southern Italy has Arabic origin and rightly comes from murābit. The etymology of the scientific binomen gets its origins from its morphology. Leptoptilos from the Greek “leptos” = delicate, elongated and “ptilon” = feather, due to the lightness of its feathers; crumenifer or in the synonym crumeniferus, from “crumena” = a leather bag for the money that was carried in the old times was worn around the neck and from the Latin “fero” = to carry. The beauty of its feathers was already known in the nineteenth century when they were used to adorn luxurius and filmy evening dresses. In all vulgar names, European as well as native, the term Marabù is reiterated. 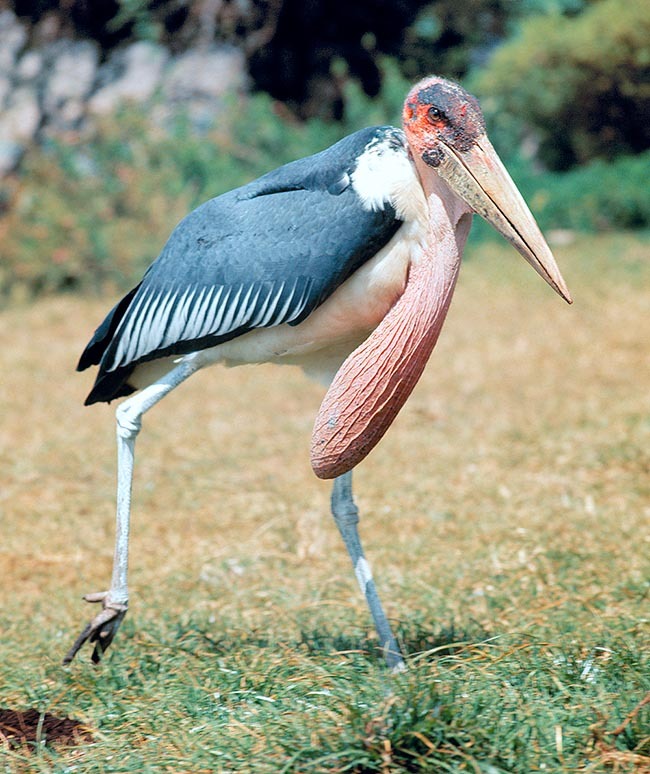 In English, Marabou Stork; in German, Marabu; in Spanish, Marabú Africano; in French, Marabout d’Afrique; in Portuguese, Marabu-africano; in Italian, Marabù africano. 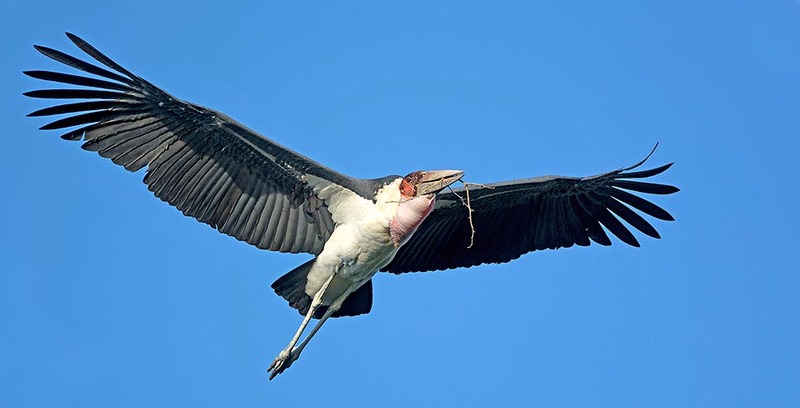 The marabou stork occupies all sub-Saharan area of the African continent where it is ubiquitous, reaching in some areas quite consistent concentrations. 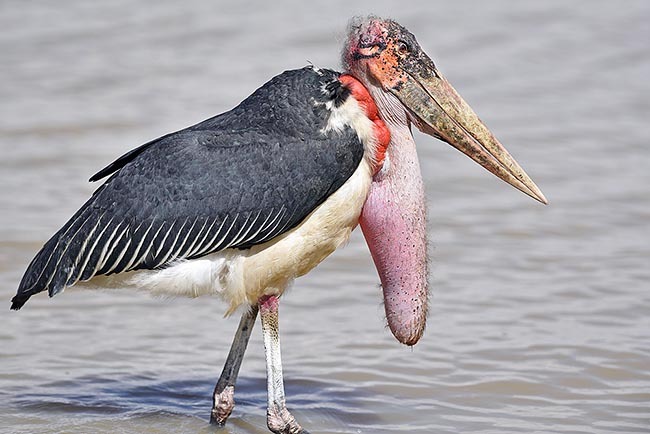 The marabou stork is a sedentary bird even if subject to vertical movements inside the continent in relation to the alternation of the rainy seasons. Also the juveniles during the first years do perform some errations. 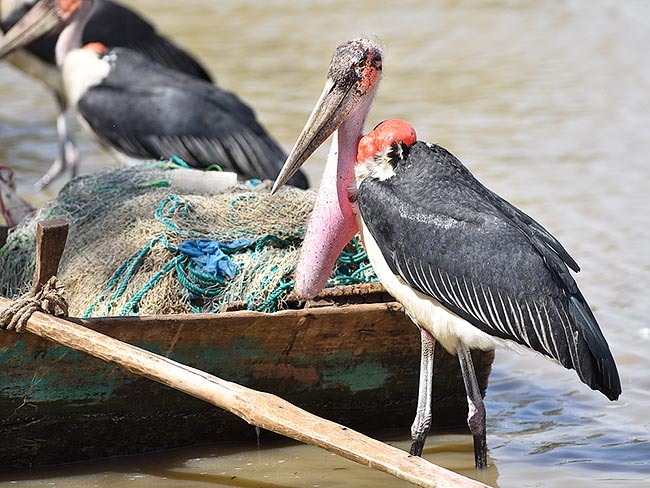 In Africa, the marabou stork is the only member of its genus whilst in Asia are present two quite similar species but much localized in the Indian area, the so-called Greater adjutant and the Lesser adjutant (Leptoptilus dubius and Leptoptilus javanicus) . Though the marabou stork is linked to the water, it can be found in any place even much far away from basins or rivers. Its aptitude to coexist with the humans leads it often to frequent villages also in pre-desert areas thus evidencing its preference for this last solution often forgetting its genetic predisposition for the water. In any case its flying capacity and the facility of movement does not pose obstacles in reaching in short time, ponds or water streams even many kilometers far away. Also the centre of big cities with sufficient green where to shelter the night and also nidify, can become its usual habitat. In any case, it is ubiquitary and can be met everywhere in its home range. With its almost three metres of wingspan, the marabou stork is one of the biggest flying birds of the planet. If to this we add a weight varying from 6 to 9 kg and a length exceeding the 150 cm, we can well imagine with which giant of the air we are dealing. When erect it’s tall as a human being, and the size of the body, massive and robust makes it seem as such when seen from far away. We have said about its ugly and unpleasant look and about the filthiness dirtying its head, the beak and the neck, but the livery is exceptionally well conserved with well kept feathers, glossy and always ready to bear the sustenance in flight of such body. The livery has the upper part of the wings of black slate colour with bluish reflections and the rest of the body is white. The very long and robust paws are bluish with big toes and strong nails typical of the ciconiids, logically unsuitable for seizing, but excellent for walking. The beak is immense, even 35 cm long, pointed, strong and able to launch deadly shots to the victims. Its way of walking is ungainly, clumsy and slow, but with dignity. To complete its bad aesthetic shape are the head and the neck. In this part of the body are totally absent the feathers and the skin is therefore bare and of fleshy colour. 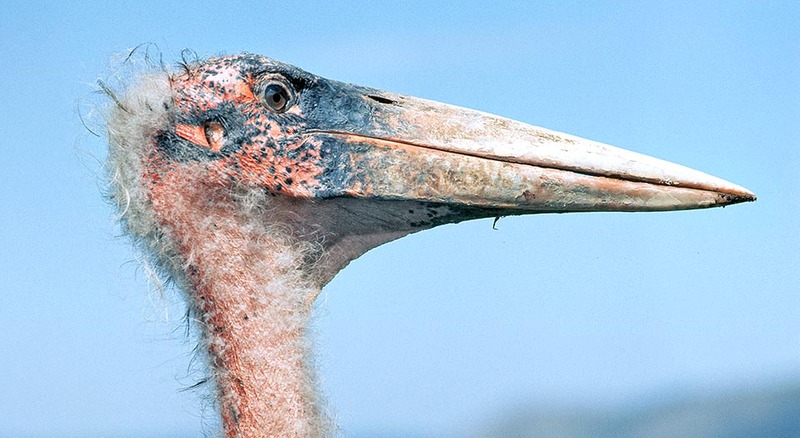 The front, the head, the nape and also the beak are encrusted by plaques of skin and of dirtiness partially raised and wrinkled, as if it were suffering from a strong form of defoliant eczema. A repulsive look and by sure suitable for the activity of necrophage it usually does. 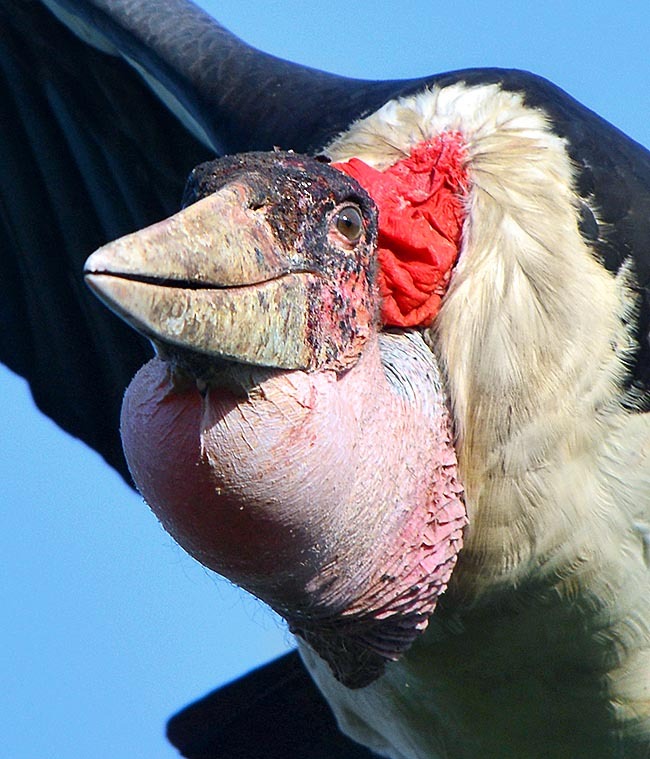 On the neck is hanging a fleshy and flabby sac that may have the same length as the beak, that becomes blood pink during the courting. As a matter of fact, this hindrance, because this it seems when not active, does not have any digestive function or as goit but only as sexual symbol during the nidification season. On the shoulders, in the rear part of the neck just close to the shoulders, it has a second sac, also inflatable, and much smaller but that becomes bright red during the courting. There is no sexual dimorphism. The juveniles show paler colours and do not have the gular sac they will show when maturity is reached by the fourth year of age. It is graceful and light when flying, a great glider that can reach remarkable altitudes when together with the vultures with whom often it accompanies. The huge wingspan shows in the underwing the remiges of white colour in contrast to the blackish lower coverts. When flying, it keeps the neck well between the shoulders. 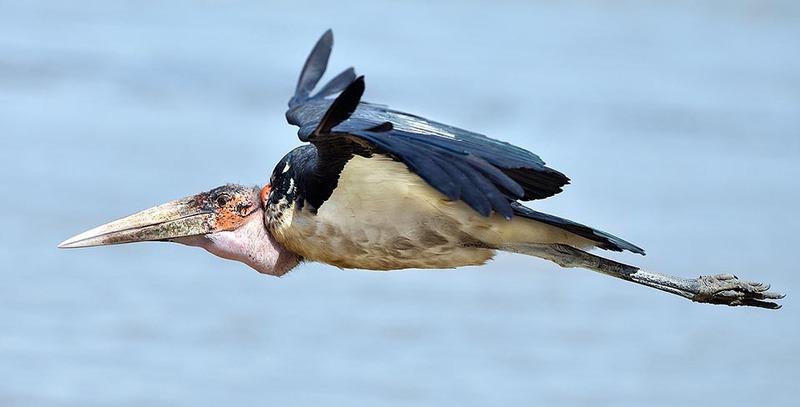 Although preferring fish, the amphibians and the small animals linked to the water, this bird gulps down all what passes in front of its enormous beak. Serpents, mice, nestlings, snails and slugs, eggs, rotting fruits and vegetables, small bones, big insects but also ants and termites. All alive as well as dead. Its opportunism, surely helped by its enormous mass, has led it to coexist wit the colonies of flamingoes fearlessly attacking the adults and not ignoring the chicks when still unable to fly or the eggs before the hatching. This is a hunting modality borrowed fom the hyenas. Living in close contact with the local populations, it has learnt how to make the most from the human activities, therefore the sites of fish processing, the public abattoirs, the landfills and any other place producing organic wastes, have become the most frequented sites. The presence of this bird is impressive in the places where the fishermen do clean the fish when back from the fishing expeditions. Stiff, silent and discreet, they encircle under siege the boats laden with fish whilst the fishermen uninterested of their presence, clean and distribute their catch throwing away behind them all what is considered as discard but that is on the contrary a tasty delicacy for those waiting. An action so natural and customary, now learnt and penetrated in the instinct of these birds, that the morsel rarely touches the ground but is seized with skill with absolute ease. Fun is the children play who often, mischievous but surely with the only purpose of satisfying their poor possibilities of play, throw stones of pieces of wood instead of the fish shown to them. Instinctively, they take the object on the fly mistaking it with the food but then reject it with the same speed with which they have caught it. Though the areas where refuses are produced are the most frequented, it is present in any other corner of Africa. It is seen in the wake of the vultures when around a carrion in the savannah but even more in the suburbs of large conurbations where it walks between the population gulping down whatever has the appearance of an organic debris and in clear fight with dogs and other scavenge animals. It is not rare, then, to see it walking wary around the tables of restaurants and bars, waiting, like beggars, that some inattentive client momentarily abandons what is eating. Modern opportunism. The marabou stork nidifies in more or less numerous colonies sharing the tree where it places its platform, with other species such as ciconiids and ardeids. At times the colonies are very extensive especially in the African coastal cities bordering the lakes of the Rift Valley, they occupy entire city districts and municipal parks. In these cases it is even difficult to find free one single branch of a tree where to place a new nest. As it is not minimally afraid for the human presence, it is often seen nidifying on the low branches close to the few city traffic lights, in the chaotic traffic of these conurbations, as if they were policemen suspended a little higher from the ground controlling the traffic below. The couple remains faithful for the whole life and also after the nidification time the partners keep in close contact even if inside vast groups. Once decided the nidification season, that often does not have fixed dates but in the dry season preceding the rain time, the courting begins made with strong bangings of the beak, gruntings and deep and noisy mumblings. The male’s neck swells and reddens whilst the sac gets hard and widens enormously taking a red blood colour. The nest is a simple platform of big branches located on the upper part of the tree, without any particular coating inside but sufficient to contain the two or three whitish eggs generally laid. On the tree there is a continual dispute any time an individual lands there or moves walking on the branches, bumping the neighbor or entering the territory of another couple, territory at times limited to two metres from the close pair. A continuous hubbub that lasts all over the nidification time but also during the night rendering impossible for any one to live close to there. 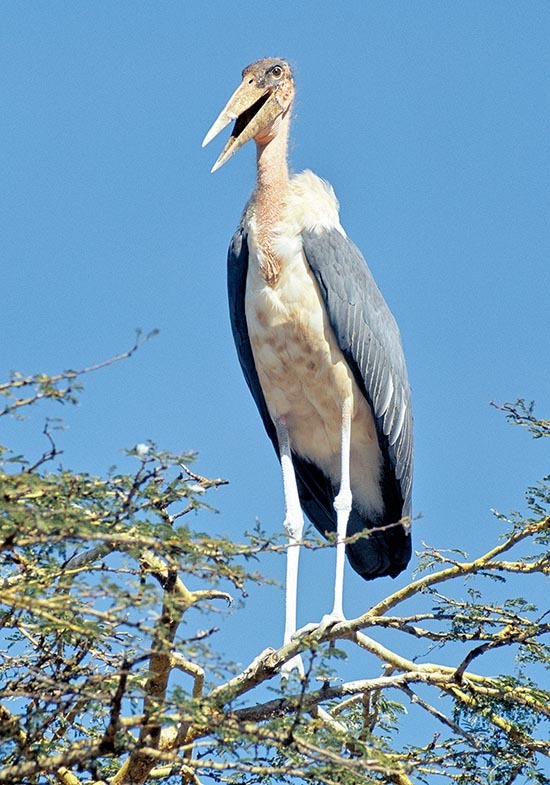 The marabou stork can occasionally nest also on the roofs of city buildings, on rural huts and on walls. The breeding lasts thirty days and the chicks remain in the nest for 12-15 weeks during which in the colony occurs an unimaginable overcrowding situation with continuous turmoil and confusion among the chicks and the adults that arrive with the food for their young. It cannot be said that it is difficult to note the presence of a colony of marabou storks even in a pitch dark.